Successfully Added External USB Sound Card (HiFi 7.1 Channel Surround Sound) to your Shopping Cart. An essential upgrade for increasing your computer audio experience for movies, games or listening to music, this handy portable device is easy to install and provides high quality audio and functionality. You want to expand and upgrade your computer’s audio capabilities so you can enjoy the amazing experience of 7.1 surround sound, but you don’t want to open up your computer and break something inside. This external 7.1 Channel Surround Sound Card solves all your problems, without you having to unscrew a single bolt or having to drag your computer down to an expensive computer shop to install an over-expensive piece of equipment that will do a similar job to this excellent surround sound card. 7.1 Surround sound is the ultimate 8 channel sound experience. Enjoy sound from 3 front speakers, 4 rear speakers and your sub-woofer bass speaker. It's perfect for large rooms where you can place all your speakers perfectly and enjoy the sounds from all corners of the room, it's an experience you have to hear for yourself. Also just think that with this External USB sound card, you can have a portable solution to connecting to your speakers, so have your surround sound system set up in your living room and you can just bring your laptop filled with movies and connect it up in a flash! Why travel all the way to the cinema, when you can bring the cinema to the comfort of your own home, the first stop you need to make is to upgrade your sound system with this External 7.1 Surround Sound Card. The External USB Sound Card is easy to install and allows the user to experience high quality cinema sound whilst watching videos, listening to music, and playing games, all in 7.1 channel surround sound. This is an essential upgrade for anyone interested in increasing their computer audio experience while also freeing up valuable computer system resources. 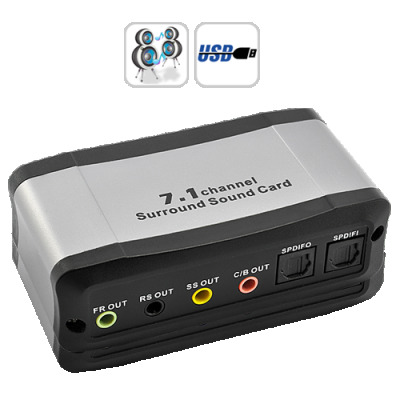 This highly flexible device audio interface provides a high quality USB audio experience; the 7.1 Channel USB sound card connects to a variety of computers through a single USB connection. This ultimately provides an impressive external audio experience that can be easily swapped between systems, without having to struggle with opening the computer case for installation. Designed to deliver a long-term and dependable sound solution, the External 7.1 USB Channel Surround Sound Card is available at a jaw-dropping price. With highly lucrative wholesale savings to be had, you can order this Surround Sound Card today and we’ll ship it out tomorrow. A great product for re-selling and dropship orders, considering the current high demand for quality home entertainment across the world, this product won’t disappoint you; available now from the leader in factory direct wholesale electronics, Chinavasion. I was really enjoying this product, and it is very good to sell. I was selling well.